Google Apps for Education (GAFE) will be the primary software that I reference, but other programs could be substituted. I believe that a key component behind any successful learning environment is good leadership. Administrators set the tone for their staff and school, including the integration of technology. I've noticed a significantly higher buy-in from staff when the administrator is the one pioneering the use of technology in the school. 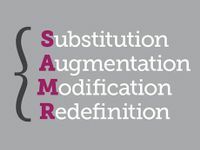 The implementation and extent of technology integration will vary from administrative use to classroom instruction. The most important concept is the tendency to encourage risk-takers toward innovation and improving the learning environment of our students. Time is a precious commodity in education for both teachers and administrators. Sometimes staff members can feel the strain of the constant meetings they might attend throughout the week. These may include grade level, content area, parent, IEP, 504, or intervention meetings. Determine if the upcoming staff meeting requires everyone to meet face-to-face after school. Can the information you are trying to convey be easily understood online? Providing a digital copy of the upcoming staff meeting to be reviewed independently could alleviate some stress throughout the building. If you are looking for feedback from staff members, include a Google Form or host a Google Hangout to answer any questions. I would definitely recommend Nearpod to all educators and administrators. It is a sleek, powerful, interactive presentation tool used by educators around the world. Using Nearpod to present a new school initiative or review performance data would be a method of keeping your staff focused and involved in the presentation. Participants can interact with each other and submit answers in real time. All of this information could be saved and shared throughout the school in order to drive future instruction. This process could also be completed using Google Slides and sharing the file with staff members on Google Drive. Even if you decide not to use Nearpod, there are many other ways to keep staff members involved during your presentation. Using backchannel tools such as TodaysMeet or Edmodo could be helpful for connecting to your audience as you present. Just like our students, some staff members may feel embarrassed about asking a question in front of other educators. This could be especially true for a new teacher or someone that just transferred to your school. If a staff member has a question about a topic, he or she can post it to the TodaysMeet live stream. This live stream can be saved, reviewed, and discussed during future meetings or professional development opportunities. Enhance previous presentations with video, audio, hyperlinks, etc. 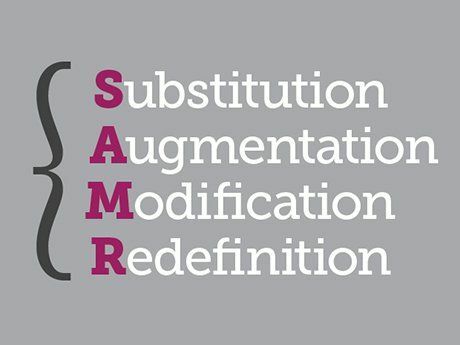 Based on your perception and tech-savvy abilities, some of these tasks may not fit your definition of SAMR. Please feel free to leave a comment below sharing your ideas.